For the sake of laziness I'm just gonna copy and paste my profile description. My absolute dream school is Harvard. My diagnostic was 148 and after getting through three months of Powerscore's 1 year study plan I got up to 157. I have been living with my parents since I graduated and was able to save up for a tutor. We are pretty much starting over so I haven't taken a practice test in a little over a month. My gpa is 3.96 but I haven't sent my transcripts to LSAT to calculate the official. I know that if end LSAT score is not high I'll receive a ton of "retake" comments. What I really want to know is if I don't reach 170 despite my absolute full effort (which I absolutely will give) and end in the high 160's, can I still have a decent chance at Harvard? I am more than willing to drown in student debt. It really comes down to a pride and sentimental value for me. All comments are greatly appreciated. Last edited by QContinuum on Fri Mar 01, 2019 5:21 pm, edited 1 time in total. With a LSAT in the high 160s, yes, you'd have a realistic chance at getting into HLS given your 3.96 GPA (assuming that's your LSAC GPA - do you have any reason to suspect your LSAC GPA might be lower? usually this happens when applicants have attended a previous college and did poorly there, or have had one or more bad grades "forgiven" by their school and excluded from their school-reported GPA). But focus on actually getting that LSAT first. You won't be getting in to HLS (unless you're a URM) with your current LSAT score. Wow thx for the quick response. No my GPA shouldn't change then. I was just unsure how they calculate it. I had no idea Harvard was regarded a little lower then YS. Could you point me to a source where I could read more about this? I believe you, I just think I was overestimating how much I knew about the top law schools given this information eluded me. taylorharris24 wrote: Wow thx for the quick response. No my GPA shouldn't change then. I was just unsure how they calculate it. You can see https://www.lsac.org/applying-law-schoo ... marization for the actual rubric, but yes, if you don't have any "forgiven" grades or other previous college grades, your GPA shouldn't change. taylorharris24 wrote: I had no idea Harvard was regarded a little lower then YS. Could you point me to a source where I could read more about this? I believe you, I just think I was overestimating how much I knew about the top law schools given this information eluded me. There's some disagreement about whether Chicago's actually better than Columbia/NYU, or whether Penn should be lumped in with Columbia/NYU, but generally the order above is accurate. 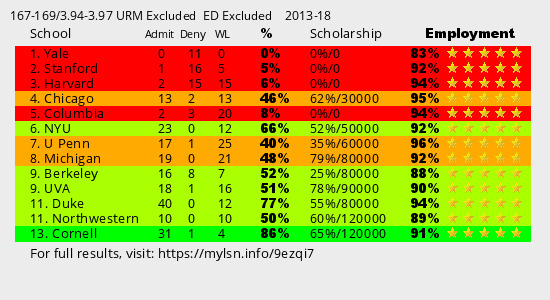 Relevant to you, Yale/Stanford are substantially harder to get into than Harvard and down. Harvard and down focus mainly on LSAT and GPA; Yale/Stanford generally require super strong softs in addition to stellar LSAT/GPA. QContinuum wrote: With a LSAT in the high 160s, yes, you'd have a realistic chance at getting into HLS given your 3.96 GPA (assuming that's your LSAC GPA - do you have any reason to suspect your LSAC GPA might be lower? usually this happens when applicants have attended a previous college and did poorly there, or have had one or more bad grades "forgiven" by their school and excluded from their school-reported GPA). MyLSN suggests they'd have to be very high in the 160s and hit an admissions officer having a good day. Wow I am so impressed. I have been using this website to read forums for a long time the response time here is unbelievable. Thank you very much. Maybe in a few months I will post an update. I might just turn this thread into my lsat story for my own personal motivation. I will not disappear. Anyways, I took another practice test, the first one in 2 or 3 three months. 150 lol. I had taken three before, but for this one i actually included an experimental section as well as a proctor. I completely froze on games and didnt even get to attempt the last one. It was crushing at first but i honestly feel great again. I plan on taking a test a weekend until Jan then I will be taking minimum of 2 a week. I'm pumped. Feels like I have been waiting months to finally start consistently taking PTs. I plan on taking em all. Hoping all those who took in November did well. It sounds to me like you should be focusing more on mastering LG first instead of just brute-forcing your way through whole PT after whole PT. You aren't yet at the stage where that might help. Since you're shooting for the top, you must focus on getting your LG to -0 consistently. So long as you're still at risk of freezing on LG, you shouldn't be just drilling PTs. You have more work to do first to master LG. QContinuum wrote: It sounds to me like you should be focusing more on mastering LG first instead of just brute-forcing your way through whole PT after whole PT. You aren't yet at the stage where that might help. Since you're shooting for the top, you must focus on getting your LG to -0 consistently. So long as you're still at risk of freezing on LG, you shouldn't be just drilling PTs. You have more work to do first to master LG. Ugh thank you!! I had a small suspicion of this but really wasn't quite sure. I should have asked this, but I am glad you pointed it out. It seems like most people are doing the 7 sage method or something similar. I'm definitely gonna start focusing on drilling. I've read different methods for what to use for drilling, some say PTs 1-40 for drilling LG, I've also seen 20-50 in a few threads. Do you have a recommendation or a number you see often? I'm about to buy all of the prep tests I don't currently have off amazon. Also, im guessing that people use all of these PTs for drilling? That is, they don't simply disregard the other sections that arent LG? I also took another practice test last sunday before I read this. I got 151. never feels good seeing these scores but I'm gonna celebrate every gained point no matter how small. I did slightly better on games as i was able to start each one, but again, i feel so mentally fatigued by the time i get there I just cant get my setups right. Once I am fresh and review it seems so obvious. I also wasn't able to reach the last RC section. On my other PT i finished every section with time to spare, other than LG, while with this one I didn't finish a single section on time. I think I'm gonna stick with the slow approach. Last Saturday I took another practice test and scored a 161 on Dec 1999. This score was actually inflated as I had already taken the first two Powerscore practice test packets, and the last LR section I had already done in one of the previous Powerscore tests. Nonetheless I was really happy. The advice to focus on games is so golden. I spent a week fullproofing the two previous Powerscore practice test LG sections as well as the LG from pt 8 and 9. I still got 8 wrong on the section but it was such a confidence boost to be able to attempt them and figure out my errors easily through blind review. Even without the inflation I still had my best scores yet for all the sections. I think this was most likely due to the confidence boost I got, LG was section 1. I definitely plan on full proofing every game out there, it is beginning to be my favorite section. I don't think I have technically 'cracked' 160 but I definitely hit a jump and a better mindset. Jan is when I will have a lot more time to devote to 2 PT's a week as well as more lg mastering. I can't wait! Don't want to be the bearer of bad news--and yes, it is possible to improve your LSAT score through study--but it's rare for anyone to improve as much as you need to to get into Harvard. I don't know why anyone would want to go to law school these days, what with the insane debt levels and poor employment options even from Harvard, but my advice is to set aggressive but reasonable expectations. Are you sure you don't just want to become a teacher or something? JCougar wrote: Don't want to be the bearer of bad news--and yes, it is possible to improve your LSAT score through study--but it's rare for anyone to improve as much as you need to to get into Harvard. This has to be a troll right? Even from Harvard? You think options are bad from Harvard? And your suggestion is to go into teaching? Nothing against teaching, my family is made up of high school teachers, but when suggesting a better career from a financial standpoint my first suggestion would not be teaching. I'm back! Was at a wedding last week and with the Holidays I couldn't do much. I'm taking in March and kind of figured the Holidays and wedding to be my last times drinking and staying out late. Pretty abysmal for LG honestly. I am yet to get below -8. Everyone says it is the most learn-able so I am considering just focusing on drilling it only for the next week in hopes of getting it to at least less than -5 on my next test. By test day I need it to be -0. Anyways, for the guy suggesting I lower my expectations I totally get it. Statistically it is a very rare thing to do to improve that much. To be honest that is the sort of person I am. I just grind things out. In high school I got horrible grades and in college I just decided I would be the hardest working student there and ended up with great grades. My intellect is completely average but I am very proud of my work ethic. I just claw and scrape my way to whatever goal I have. At the very least I have to believe this if I am going to reach my full potential on the LSAT, even if it doesn't mean I can get 170. I honestly believe that even though I don't have the dazzling diagnostic that most high scorers start off with, with lots of hard work I can raise my ceiling to match those 170 scorers despite an average start. Anyways, sorry for rambling, I hope whoever reading this had a nice holiday. As always, thank you for any suggestions , advise or encouragement! This was Oct 2000 btw. Just keep doing what you're doing. 8 points in a few months is pretty good progress but push harder. Agreed on not doing PT's, and I'd take Qcontinnum's advice a step further to state you should be doing this on every individual question type in LR as well. No sense in doing tons of full sections if you don't know how to do each individual question yet. UBETutoring wrote: Just keep doing what you're doing. 8 points in a few months is pretty good progress but push harder. Props, OP, for your recognition of how valuable time invested in the Lsat is. You’re smarter than most 0Ls on this site. First of all, it's great that you've been pushing yourself and improving so much OP! LG is definitely learnable so it's the area you want to be worst in, if that makes sense. But to just follow up on this question you asked, it's a little overly dreary but not wrong. The vast majority of people at Harvard go into big law. They work their asses off with ridiculous hours/stress for approximately four years just to come out even (i.e., their debt paid off). Shortly after that they often leave big law to an area that pays dramatically less (still more than a teacher, but not always a lot more). When you factor in the sunk cost of three years of your life in law school, the prospects still aren't amazing. But it depends on where you came from, how well you deal with stress, and what your current options are of course. I just wanted to flesh out the initial comment. I would bet that the average teacher is happier in life than the average recent HLS grad. objctnyrhnr wrote: Props, OP, for your recognition of how valuable time invested in the Lsat is. You’re smarter than most 0Ls on this site. Thank you! I think a lot of my motivation comes from the mods/posters on this site and their input. I definitely would not have started this early without coming here first. Ah good points. For me it honestly isn't about the money or hours or going into big law even. It sounds silly and may very well leave me worse off if for some crazy reason actually happened, but Harvard has more of a personal value for me. I don't really care about the debt or income following graduation (I know that's dumb) but for me I just want to prove myself I can do it. At this point I don't think it is exclusively Harvard either. An acceptance letter from any of HYS would give me a feeling I don't think I can fathom even though I can't help myself from imagining it all the time. I know that sounds like a lot especially since I haven't even taken the LSAT yet. I honestly think I would probably feel the same way with any of the top 14. I'm not even entirely sure if I got accepted into H i would even go any more if I had good scholarships elsewhere, it really is out of my budget. An acceptance letter though? I can't even imagine how proud I would be of myself. I think this position is starting to convince me though. I don't think it's practical playing this hypothetical over in my head because it sounds so outrageous, but I think if given the opportunity I would go elsewhere for money. Thx for checking in on me! That's a very reasonable approach. I'll admit I was quite proud (and still am) of my HLS acceptance. But I'm even happier I took the money and went to Penn. I just finished another PT around five minutes ago (DEC 2000). This time I got a 161. I got -6 on LG which is a huge improvement for me. I spent nearly all week working through 1993-1995 logic game sections. Still not where I want to me but I'm liking the trajectory. This test was slightly frustrating.. I've been taking them all in the library and during my reading comp section a man next to me fell asleep and starting snoring extremely loud. It was sort of funny but then people came over and tried to wake him and couldn't. People were actually dropping books from eye level and yelling in his ear in order to wake him up and stop his snoring. It was honestly pretty funny but distracting none the less. I got my one of my worst RC scores thus far and got -4 on the last section when everyone was trying to wake him up right before my break. Pretty funny honestly. I was hoping for a score increase but at least I am figuring out my average. I think someone UBET, the lsat tutor posted above that i should learn the different LR question types. I actually think I have those down pretty decent to be honest. I'm usually good at recognizing I just make silly errors or don't process something correctly. I am also still skipping parallel reasoning questions if they arent in the first ten and don't always have time to get back to them. A couple of random thoughts, as I am working on mastering the beginning LG sections I get a little frustrated because I always do well on 3/4 of the sections until I come to a game that just seems so strange and is unlikely to come up on future lsats again. I always do worse on them but I try to include them in the reps anyways, I figure it can't hurt and could possibly come up again. Another is that I've actually been taking all my lsats in public libraries. I've come to learn that there are a lot of interesting people who tend to come through and a lot of times can make some interesting noises that they don't realize are loud. I actually sort of like it (Excluding the sleeping man) as I think it helps to create distractions. The only issue is they don't open until 10am and my test is at 8. From now on I plan on waking up at 6 to mimic the time it will take to eat breakfast and drive to the testing center. This means I'll be testing in my apartment though and will no longer have the quite noises of the library. I've also noticed how much my diet affects things. I'm pretty big into weights and for the last two months was cutting. I was heavily restricting carbs and this past week I actually ended that cut. I made sure to eat hasbrowns this morning before my test and it is remarkable how much more endurance I have. Normally as soon as I am done with a test I grade it and speed out the library but I think I am going to go ahead and review a section or too. Maybe it's just by endurance building up naturally through repetition, more score didn't really reflect it. I think I will still stick with carbs in the mornings anyways. Sorry for rambling, my head is always weird immediately following test. Thx for reading if you've made it this far! Your enthusiasm is inspiring. Keep it up dude. You got this. OnThePrecipice wrote: Your enthusiasm is inspiring. Keep it up dude. You got this. Wow I'm glad thank you! Also, I don't normally care much for grammar but goodness was that last post by me hard to read.. Please excuse my errors especially on posts following tests.. My brain is usually pretty fried. I wish it would let me edit after someone else has responded but oh well. Yesterday I took June 2016, I sort of skipped ahead. I plan on doing around 1 pt every 10 days or so, so continuing to do the early 2000's seemed a little silly when I am taking in March. I will save a good amount of the newest ones in case of June or July as well. This way I can keep taking PT's and keep mastering games in between. I ended up with 163, as I've said before I will celebrated every point earned! Below was how it went. By far my best LG score yet! I didn't sit in the library this time which was nice but the wifi got stuck so for one section my online proctor couldn't work. Luckily I realized this and just ended as soon as my watch said 35 mins so I don't think it really had an affect on my score. I'm now pretty much two months out and I told my self I would start to take my weekends very seriously from this point on. Before I had really slowed my drinking and staying out late but was still spending Fridays/ Saturdays usually doing something with friends. From here on out I think I'll replace that with a second study session in the afternoon. I think I'll be able to review tests quicker and add more supplemental drilling for games and LR that way.